CANNON FALLS, Minn. – As part of its $1.5 million investment in the Cannon Falls community, SpartanNash has begun renovating the Econofoods located at 425 W. Main Street in Cannon Falls, giving it a customer-first focus and additional amenities throughout the store. To begin the transformation, the store will be rebannered as a Family Fare Supermarket, where store guests can continue to find fresh selection and the best everyday values for their money. The same associates – many of whom are Cannon Falls residents themselves – will continue to work in the store throughout the conversion, serving store guests with the same level of customer focus and dedication to personal relationships as ever. An expanded produce department with a wide variety of organic and local farm-fresh products. The store will also be reset to make it easier to navigate the perimeter and aisles, and new signs, flooring and décor will highlight the updated interior. A Welcome Center will be added near the entrance, allowing store guests to pour themselves a cup of coffee or grab a bag of popcorn to enjoy while shopping. 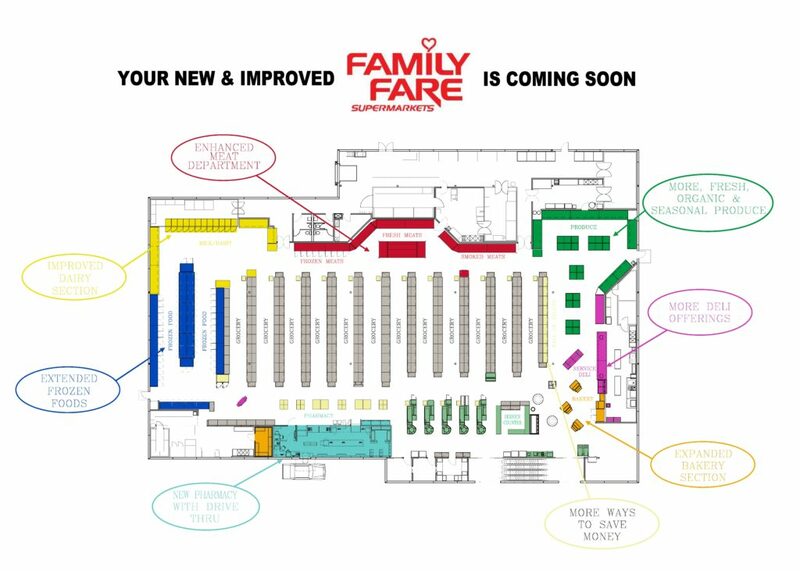 New checkout stands and an updated Guest Care center will also be new features in the Family Fare Supermarket. In addition, 10 for $10 bins will provide store guests with great deals and more ways to save money. The exterior of the soon-to-be Family Fare is also receiving a facelift. “We want to deliver a best-in-class experience with every trip to the grocery store, and this new and improved Family Fare will do just that,” Swanson said. “Our commitment to our customers will always be our top priority, and we appreciate their patience during this renovation. We know remodels can be a temporary challenge, but we’re using our expertise to minimize any disruptions and we’re confident customers will enjoy the transformation. In 2015 and 2016, SpartanNash invested more than $30 million in the greater Omaha, Neb. area to remodel and rebanner 14 stores to Family Fare Supermarkets. In total, the company operates 82 Family Fare stores in five states. This will be the second Family Fare in Minnesota, joining the location in Moorhead in offering store guests easy-to-navigate stores, huge savings, weekly ad special, and plenty of variety to help stretch a family’s food budget. The current project began when the Scofield Drug and Gift moved into the Econofoods store, providing store guests and long-time customers with the same great service and friendly faces. The pharmacy will also have the added convenience of a drive-thru option beginning in the spring. The renovation is scheduled to be completed in early May 2017, and the grand reopening will follow shortly thereafter. Store guests will be invited to attend the ribbon-cutting ceremony, which will kick off a week of grand reopening celebrations. Store hours will remain the same throughout the renovation.